Romeo and Juliet, Othello and Desdemona, Intel and AMD, Quasimodo and Esmeralda, Jack and Rose, ATI and NVIDIA... all these pairs are bound to each other by dramatic events that happened in life or in a book. Romeo and Juliet gave their lives for each other, Quasimodo was ready to embrace death for his beloved, Rosa had cherished the memory of Jack and even dropped the most expensive necklace in the world into the ocean for him... But ATI and NVIDIA... cannot live without each other either. If one company doesn't launch a product in time, the other company have the blues and start complaining about the lack of competition. If one company publishes a secret article (supposedly for its partners) that exposes what the other company concealed and then gives it to mass media in hugger-mugger, the second company immediately responds in the same manner: "You are another!". When 3dfx was alive, it passionately adored NVIDIA, mutually at that, which is confirmed by still available marketing speeches from both companies, where they fouled each other's reputation. NVIDIA couldn't bear the end of its friend, sheltered it, and is still keeping it. That's a great love! 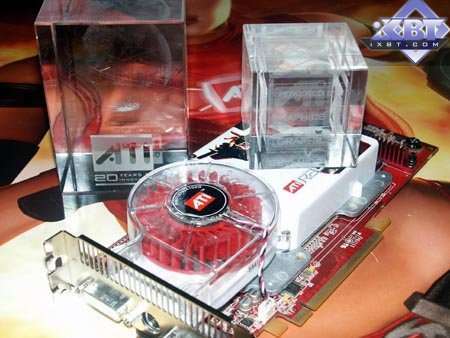 We remember the times when AMD had been on the verge of death, before Athlon was launched, which raised the rating and financial well being of the company manifold. Virulent tongues spoke of Intel's interference, who found a cunning way to sponsor AMD so that it could carry on with its popular processors (I repeat that these are just rumours, don't hold us responsible for the accuracy of this information). So competition and hatred come along with hidden love. Only zealots from ATI and NVIDIA do not see and do not want to see fine threads that connect these companies. To say nothing of scarier zealots among users of products from these companies. Even briefings and various events are conducted diplomatically, nobody mentions NVIDIA during ATI's events and ATI on NVIDIA's conferences. They always use the polite and politically correct term "our competitors". So, we stopped at the thread that connects both companies. Even if we get rid of sarcastic tone, which can be suspected by skeptics, the thread, no, a cord, no, a ROPE really exists! It's Microsoft. Yep, a common API is actually a connection between the products from both companies. But we should be more specific - common APIs, because we shouldn't forget about OpenGL. Besides, this API is NVIDIA's hobby horse. Indeed, everybody acknowledges that ICD from this company is really finetuned. So, using DirectX 9.0c with SM 3.0 support together with NVIDIA, the Canadian company carries on its counter-offensive and launches a new top gaming product. Everybody knows that ATI was living through hard times, the X1xxx launch was too late. Besides, the company still has problems with mass shipments of the X1600 series products. ATI had to correct mistakes by new prices and updated positioning. Frankly speaking, NVIDIA also made a mistake (who knows, maybe it was out of love :) - shipments of the most powerful accelerator (GeForce 7800 GTX 512MB) turned this product into an antique rarity, there were even some auctions to sell these cards. That is this accelerator is not available on the market yet (yet means at mid-end of January, we'll see what'll happen later on). That's why the RADEON X1800 XT is currently the most available top Hi-End accelerator. Of course, it's not a 100% leader, the overclocked GeForce 7800GTX sometimes catches up or even outperforms it. And there are a lot of companies that manufacture usual 7800 GTX cards with increased clocking. The company in Toronto also understands well that it failed to create a king. That's why the R580 is in a hurry to replace it (we all remember the similar situation with NVIDIA's NV30 and NV35 - nobody learns from the other people's mistakes, as is always the case with sweet couples :)). And now my colleague Alexander Medvedev will tell you everything about the RADEON X1900. OK, it's a correction of R520 mistakes. A higher-performance modification of the chip with an increased number of pixel processors (the number of texture processors remains the same), which actually pretends for the palm in competition with the most powerful modification of the G70 - GeForce 7800 GTX 512 running at a higher frequency. First of all you should read our R520 review, as it's written in comparison to the recently launched R520. SM 3.0 support (Shaders 3.0) including dynamic branching in pixel and vertex processors. Attention: there is no vertex texture fetch. Support for FP16 format: full support for output into a frame buffer in FP16 format (including any blending operations and even MSAA). FP16 texture compression, including 3Dc+. Attention: no support for hardware filtering during FP16 texture sampling. New RGBA (10:10:10:2) integer data type in a frame buffer for higher quality rendering without FP16. Memory controller with a 512-bit internal ring bus, two 256-bit contradirectional rings, (4 memory channels, programmable arbitration). Hardware video processor (for video compression, decompression, and post processing), new generation that can accelerate operations with H.264 — a new algorithm for video compression used in HD-DVD and Blu-Ray video discs. Differences from the R520 are marked green - improvements, which led to a new codename of the chip. Disputable issues of the R520/R580 architecture are marked red, we already paid attention to them in our reviews of the R520 and other chips from this series. 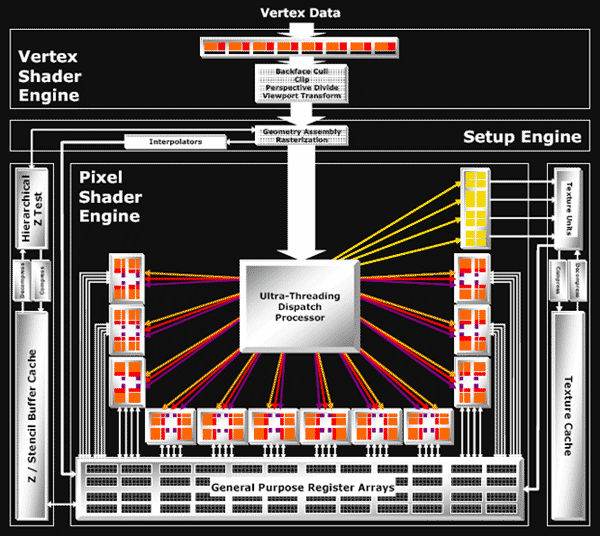 So, we can see on the diagram that there appeared much more pixel processors, but the number of texture processors (units) remained the same - 4 quads (i.e. 16 textures sampled per cycle). We can see an evident disbalance, which we already discussed in the articles about the RV530. (But ATI experts think that this is no disbalance, but a good compromise, as the ratio between computations and texture operations in modern games may reach 7 (and higher) to 1). We shall not read the tea-leaves to learn whether it's justified. We'll check it up with our tests, both synthetic and games. Especially as we can now afford a unique comparison between R520 and R580 at the same frequency - in fact they differ only in the number of pixel processors. This comparison will tell us where an additional computing capacity gives an advantage (up to three times, according to ATI) and where it's wasted. Of course, it will be up to programmers of future applications to decide whether to turn to computations or no. Moreover, this turn will happen sooner or later. As for now, we'll try to emulate this situation in synthetic tests.